It was rare in any Indigenous culture to see women disrespected, and even more rare to see them disrespect themselves. A product of the world we have created, our girls do not understand the deep and inherent power that is their birth right. The iskwêwak project is my passion project. As a secondary educator I have seen first hand the effects of a male dominated society on our young women. Combined with working or single parent family dynamics, and the effects of poverty very few escape unscathed. That said, I also know the power that a single positive relationship can have in a young person’s life and I am determined to provide that support where ever I can. The Plains Cree word for Fire is “Iskotew”(iskotêw). The “otawew” (otêh ‘heart’) of our lodges/tipis is always the iskotew, as without fire, we would not have survived. As such, fire is seen and understood as “pimatisowin” (pimâtisiwin ‘life’). The keeper of the lodge fire is iskwew (iskwêw ‘woman’). 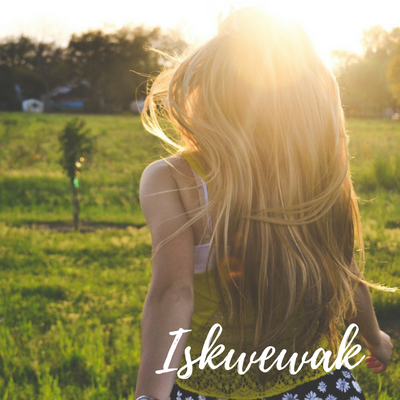 Iskwewak (iskwêwak, plural) are the givers of life which is why the second root word in iskotew comes from the Cree word for heart. “Kaytayak” (kêhtê-ayak ‘elders’) say that the heart and strength of the Nations comes from our women and the initial thread of this power is transferred in infancy during the time when a child is breastfed. Half of the woman’s spiritual power, her strong physical health, her courage, her kindness etc. is passed on to the child during this time. Kaytayak say that there is nothing so strong as this gentleness because there is nothing more gentle than this real strength. With that in mind, I am thrilled to announce that elder Kerrie Moore has agreed to lead our first seminar. Kerrie is a Cree/Metis elder who’s teachings stem from Cree and Metis cultures, she currently resides and consults in Calgary, AB. Together we will work with a group of young women from Saskatoon Public school division to help them realize their potential through Cree ceremony and culture. While it is not necessary that the girls have Cree heritage, they must be comfortable working within the protocols and understandings of plains Cree culture. Beginning with the drum and rattle, we will introduce participants to the power of creating your own space. Drumming has been an integral part of Indigenous cultures since time immemorial. In many traditions, Indigenous women used a hand drum to sing lullabies to their babies to help the baby connect with her and to their culture. The drumbeat also represents the heartbeat of Mother Earth. Energy travels through the vibrations of a drum, re-aligning with our bodies natural rhythms and we connect to our mother’s heart beat again – nourishing our body, mind and soul. Our young women will be provided with the materials and teachings necessary to create their own drum or rattle and before we part ways, will be gifted with a song. We will finish our time together by celebrating our strength as women and our important roles in our community with a traditional Cree Tea Ceremony involving song, drumming and prayer. The purpose of this ceremony is to celebrate our grandmothers and all the women in our lives who shaped us. We will share the power of women in moon time so that we may reclaim our female stories and replace those commonly held myths of feminine frailty. Given the current state of educational funding, we are actively looking for project sponsors. If you or your company have found yourselves in a position to support the empowerment of our youth in Saskatoon through the acquisition of culture and community we would be extremely happy to hear from you.